We hate excuses. Every real athlete does. But every serious athlete also puts in a night shift if he can't make it down to the box or affiliate at certain occasions. When we think of racks, the first thing that comes to everybody’s mind are those huge steel cages with plates and additional equipment to attached all over the place, wasting a lot of space and costing an awful load of money. But there are some really good racks perfectly suited for smaller gyms and especially home gyms. These racks are very robust and stable, however they are put together only with a few parts and are hardly wasting any space. These racks can be equipped with a pull-up bar making it suitable for a full body workout – no matter if you want to do squats, Olympic Lifting, bench pressing, pull-ups or muscle-ups. Plus you don´t have to spend money anywhere near the price of those big racks. 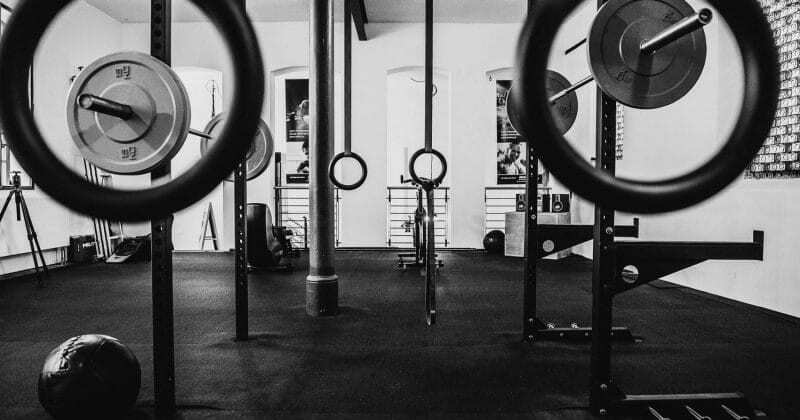 Rigs are somewhat more sophisticated in terms of mounting and installation, but offer more CrossFit-specific training methods without leaving out one of the trainings mentioned above. 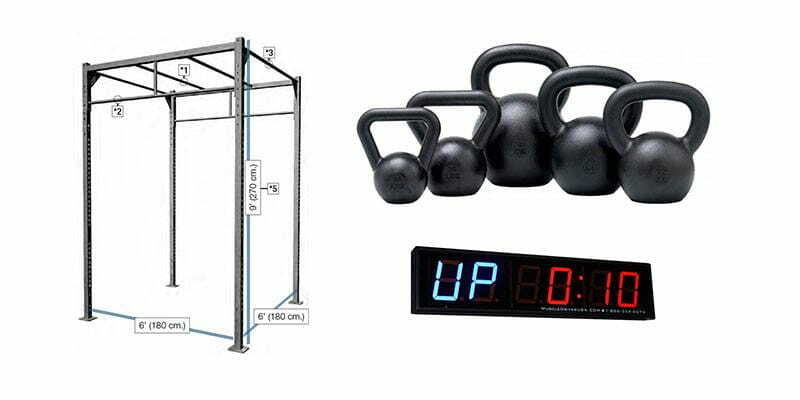 Even for small garage gyms there are single-person wall-mounted rigs that can offer the possibility to attach further equipment due to modular configuration. The most simple option would be a wall-mounted pull-up bar, that doesn´t give you the opportunity to squat or rest your bars on. To load the bar you obviously need weight plates. In this case, bumper plates are ideal because you always want to drop the bar after doing deadlifts and Olympic Lifts. That’s tough to do with regular plates as they are not designed to be dropped and will take damage from it. For snatches, squats, high pulls, benchpress, clean and jerks etc. you need a decent enough barbell. A bad bar might seriously hurt your joints such as wrists, elbows or shoulders. Knurlings, turning and bouncing abilities and markings for Olympic and Powerlifting are just a few quality factors you should look for and base your decision on. Don´t try to save money on either barbell or bumper plates as this equipment is an absolute must-have and you also should ensure high quality for the above mentioned safety matters. A timer or a stopwatch is absolutely crucial for your home gym as many Crossfit workouts are time-based, e.g. the time has to be recorded, rounds starting every minute etc. Wall-mounted timers are ideal as you can see them from anywhere. But of course there are smaller and cheaper solutions such as portable timers or classic stopwatches, too. Explosive exercises are jumps, throws or Olympic lifts. But Olympic lifts take skill and can beat you up if your technique isn’t perfect or if you have any wrist, elbow or shoulder issues. Even some medicine ball throws can cause trouble for athletes suffering from shoulder problems or injuries. This brings box jumps onto the plan – vertical, hurdle and broad jumps can be pretty tough for athletes who aren’t prepared to them, but anyone can do a jump onto a box of mediocre heights, making box jumps an ideal exercise for explosive power. If you are looking to train heavy, you´ve got to have some chalk. It´s that simple. You know how to use one of these and it doesn´t take a high skill level. Kettlebells are very good for swings and snatches, presses, rows, shrugs, etc. and can really push you to the limit. They shouldn´t be missing in any MetCon workout! Bands will help and support your training in many different ways. Use them for warmup, recovery or rehabilitation sessions, stretching, as support for difficult pull-ups or as additional counterweight for squats or benchpresses. Also, coming from injuries, bands will help you slowly get used to weights and resistance again. Especially for lower body hypertrophy, conditioning, speed and strength training, sleds can nowadays be found in numerous gyms, affiliates and even professionals sports clubs and teams. You either push (lower body) or pull (upper & lower body) the sleds, which are suited for many different surfaces, making it also usable in your garden. Nothing compares to or replaces it! A thicker grip gives you a better and safer feeling for your elbows and shoulders and will also increase your forearm size and grip strength. You might not be able to use your usual weight at the beginning, but your grip strength will increase giving you a competitive edge.